Does the Nikon 1 J2 interchangeable lens camera improve on last year’s model? 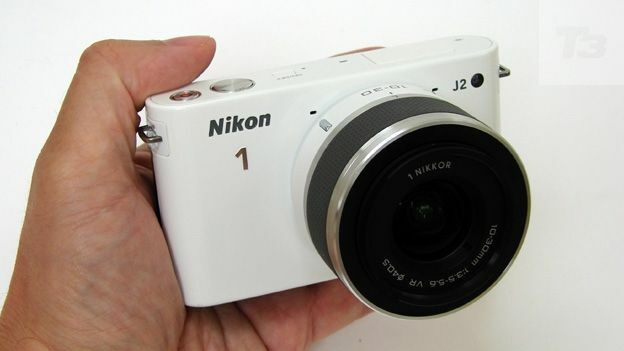 The Nikon 1 J2 is the brand's third compact system camera, and the first for 2012. Building on the Nikon 1 J1, is this update enough? When Nikon entered the compact system camera (CSC) market in 2011, a full year or two after most manufacturers, the reaction was 'about time'. However, while both the initial Nikon J1 and more fully featured Nikon V1 matched the smaller bodies and smaller lenses of rivals, they also came with a sensor that, at one inch in size and christened 'CX format' by Nikon, was still smaller than the chips found in CSCs from Samsung and Sony, along with all digital SLRs. 'Not a serious proposition', mumbled the doubters. Since then Nikon's nemesis Canon has also belatedly entered the market with its EOS M.
It's arguably more important than ever then that this second generation Nikon cuts the proverbial mustard, though at first glance the glossy entry-level Nikon J2 won't do anything to silence gripes about style over substance. Seemingly signalling that it's aimed at the youth market it comes in a choice of six colours, including pink, orange and the admittedly rather attractive white sample we were sent for review, which is available as a kit with 10-30mm zoom lens, for a suggested £499 in all. Headline resolution remains a modest 10.1 megapixels, while sensor dimensions are unaltered from last year's J1 too; in fact its 13.2x8.8mm CMOS is the same physical size as that found in the 20-megapixel Sony RX100 point and shoot. Which is a sensible way of viewing the J2 – as a snapshot camera, albeit one on which the lens can be changed for theoretically better pictures than your average pocket camera. Also launched alongside the J2 are a new waterproof case and a slim 11-27.5mm zoom, the latter at £180, demonstrating that Nikon is aiming to expand the accessory range for its still fledgling system. Or could it be something of a smokescreen for the fact that the J2 hasn't changed much from the J1? Outwardly the J2 hasn't deviated at all from the agreeable design of J1 with its retained rounded corners giving the camera a softer, approachable look that will chime with its target audience of those stepping up from a cheaper snapshot. It still looks cleanly minimalist and futuristic when viewed front on, while top plate controls comprising recessed on/off button, large shutter release, video record button, plus hidden toothbrush resembling pop-up flash with manual release catch at the back, are identical to its forebear. The more conventional camera controls, such as a dime-sized shooting mode dial, have been banished to the backplate, where they sit in a row to the right of the fixed screen. The purpose of separate display, playback, menu and delete buttons is obvious, while in their midst sits a four-way command pad, with exposure, flash and self timer options, plus a setting for locking focus and exposure, the like of which is more commonly found on a digital SLR. This pad is again encircled by a scroll wheel with which to scoot through on-screen options, as an alternative to tabbing through them one at a time. The shooting mode dial features five options – including a Motion Snapshot effect that 'animates' a still by recording a one second video snippet alongside it and adding a little musical flourish when replayed in-camera. Next along on the dial we get the Smart Photo Selector whereby the camera will take a quick burst of images and select for you the one it deems the best exposed and sharper focused, plus a standard Auto mode. Last on the dial are a Creative mode and a dedicated video mode. You can quickly access the options in these last two modes by pressing an easy-to-miss 'F' button top left of the dial, a new feature this time around. Creative mode is where Program, Aperture Priority, Aperture Priority and Manual mode are 'hidden' for example, along with various pre-sets for common scenes and subjects. It's worth adding that, like the standard 14-42mm zoom provided with Olympus Pen models, the 10-30mm zoom supplied with our Nikon J2 features a button that is held down when retracting the lens in order to lock it in place and maintain a slim combined camera plus lens profile for transportation. However, rather than pressing the top plate power button and having to expend another couple of seconds extending the retracted zoom – as on the Olympus – on this Nikon merely turning the lens barrel itself will power up the camera, whilst performing the same action in reverse will neatly power the J2 down. The non-angle adjustable 3-inch LCD screen used for shot composition and review at the rear of the J2 has had its resolution boosted from the 460k dots of the J1 to 921k this time around, not that the increase is immediately noticeable in terms of a boost to the visuals. The screen is perfectly usable however and we had no issues when shooting outdoors or interiors. Unlike last year's range topping V2 model, there's no electronic viewfinder included on the J2 (as there wasn't with the J1), nor is there a hotshoe or accessory port via which one might be attached in the future. What you see is what you get, and Nikon would of course argue that the chief priority for the J2 was maintaining a compact size and weight, not cramming it with features the non-enthusiast might never use – hence also why no manual controls feature on the shooting mode dial. What the screen does miss is any touch shutter/touch control options, as have featured on more recent rival CSCs from Olympus and Panasonic. But the screen on the J2 isn't a touch panel. The Nikon J2 comes supplied with a mains battery charger out of the box, plus an EN-EL20 lithium ion rechargeable pack for the camera itself – the same as that supplied with the J1 which delivered 70 minutes of Full HD video or 230 still photos. The still photo amount remains the same on the J2, but video duration drops down to 50 minutes if shooting at the highest possible frame rate of 60fps, at maximum movie resolution. This is, as with the previous model, an acceptable though less than ground-breaking performance. As with the J1 model the J2 boasts the Full HD 1920x1080 pixels resolution video with stereo sound – which isn't always the case with an entry-level model – but there's no anti-shake built into the camera body, so opting for lenses with the feature, which Nikon denotes with the letters 'VR' (Vibration Reduction), is even more essential. Luckily the 10-30mm has this feature, though its focal range isn't especially extreme or challenging in that respect and indeed, as regards practicality and performance, because of its physical size the J2 really is a camera for using with more modest lenses in terms of focal length. That's to say the modest 10-30mm zoom here is a good starter option and suits the camera. Images – whether stills or video – are clear and crisp and colours realistic in the main, and we were able to get really quite decent results merely by pointing and shooting, even in lower light – which is where the modest resolution yet larger sensor does it stuff - so anyone will be able to pick up the J2 straight away and come back with pleasing shots. If you're looking close however, familiar bugbears do remain, such as pixel fringing towards areas of high contrast and some loss of definition and subtle curvature towards the edges of the frame at maximum wideangle, plus a softer appearance to images at maximum zoom if shooting faraway subjects. Generally then the J2 acquits itself well in being better than your average compact and almost a match for an entry level DSLR – which is what you're paying for. Nikon has clearly taken an 'if it ain't broke, don't fix it' approach to the 10.1 megapixel J2 compact system camera, which, while it doesn't make it an especially exciting model to review, you can see some sense in, particularly as Nikon is claiming its predecessor was the biggest selling model in its class across Europe. However with rivals now making big features of the likes of Wi-Fi, connectivity with your smartphone to engage easier with social media, and even, with the likes of the brand's own Nikon Coolpix S800c and the Samsung Galaxy Camera, the ability to connect to the Internet via the camera itself, for a second generation product, the Nikon J2 suddenly feels very conventional. While it might come across that we're on a bit of a downer when it comes to the J2, that's not wholly the case. It remains a fun and funky jack-of-all-trades consumer camera, and a good introduction for those who want to start experimenting with different lenses but don't want the bulk of a digital SLR. The fact that hardly anything has changed between this model and the last means that if you do now see the 'old' J1 model going cheap, it can be considered a bit of a steal.